"When we decided to sell our family home after 30 years, we knew we wanted to hire a company with, an excellent reputation for customer service, name recognition and a proven commitment to the local community. Windermere was the obvious choice. Our agent, Ginna Demme, proved to be an outstanding representative as well. Her market analysis, advice on pricing, tips for staging, marketing plan and strategy on offer reviews were all spot on. As a result, we received multiple offers within the first week. We accepted one from a pre-qualified buyer for well above the asking price and closed before the end of the month. Ginna remained in contact with us throughout the entire process. Ginna exhibits great enthusiasm not only in regard to real estate but in all aspects of life. She is knowledgeable, professional, personable, compassionate, fun and genuine. We expected a lot from our agent and she far exceeded those expectations. If, in the future, we have need of an agent, Ginna will be the one we call and we would encourage anyone, whether buying or selling, to do the same." 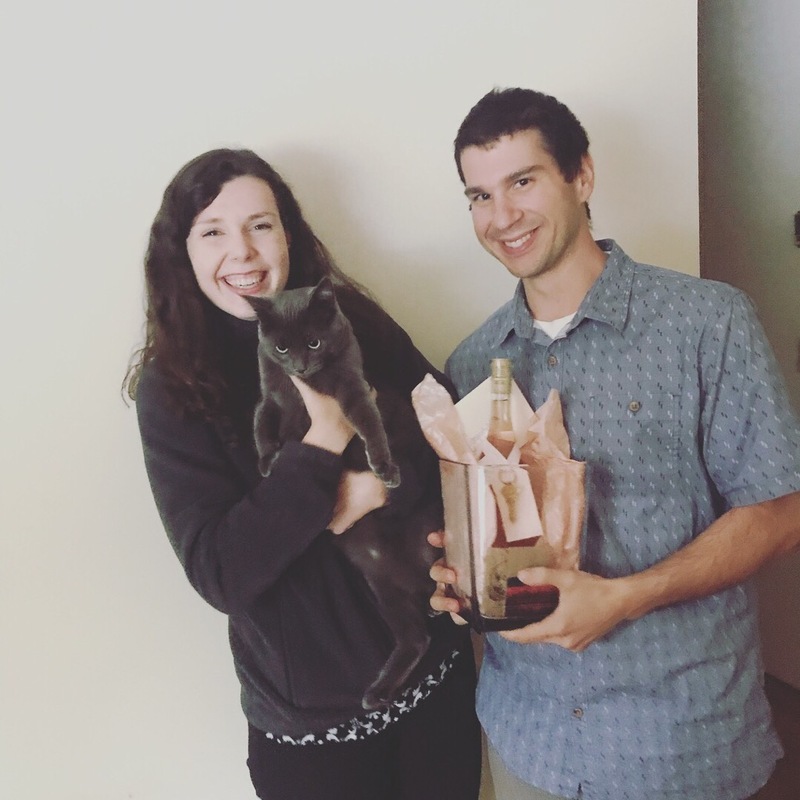 "My Fiancé and I were on the hunt for our first home together. We had very specific wants and needs for our new home. 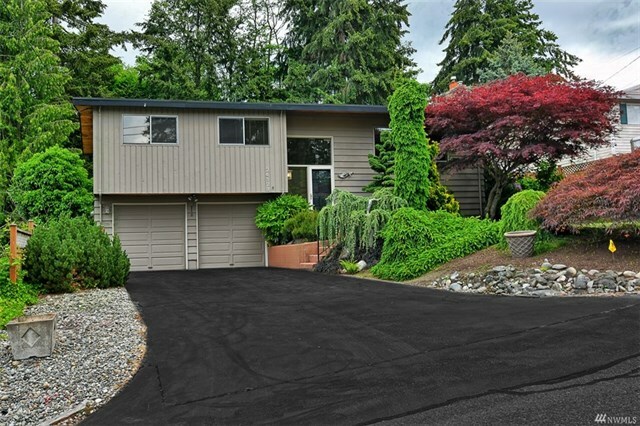 From location, layout, Rambler only, even driveway steepness and more. Ginna listened to all and worked very hard to find us the prefect home for us. She was there for us every step of the way and fought for what was right though out the whole transaction. We now enjoy our new home and have Ginna to thank. She works with kindness, compassion and Confidence. I would highly recommend her to Any one in the market for a new home!" "When preparing to sell my condo I had no idea as to pricing, preparation, etc. When I first contacted her, I still had to do remodeling and go through major surgery. Ginna was incredibly patient with me and worked very hard to explain things and make sure I understood my options. She was never pushy but simply faithful in maintaining contact and letting me know she was available. She is incredibly honest and friendly. When I was ready to sell, I needed a quick sale as I had already rented an apartment in another state. I trusted her professional advice and she got me 3 offers in 2 days... and a fantastic cash sale. She has my highest recommendation. Thanks, Ginna!" "I'm a first-time home buyer who has no experience or ideas of what I was doing. I started off with a different team that didn't work out then was suggested to work with Ginna through a friend's mom. I am glad I did! Ginna is amazing and very understanding about how stressful this process is. She has compassion when the stress starts to get to you, and is genuinely excited when you are. She walked me through the entire process and together we found a perfect 1br condo for myself. I would most certainly recommend Ginna for your future buying or selling needs." "We absolutely loved working with Ginna! She is kind, compassionate, knowledgeable, friendly, and super responsive. She worked hard to help us get the property we wanted, despite our difficult personal circumstances. We whole-heartedly recommend Ginna. She is a top-notch agent!" "Ginna assisted me with buying a new downsized home. I find Ginna to be warm, friendly, energetic, knowledgeable and very customer oriented. She is quick to respond to calls and emails, and wanted to be sure that I had all the information needed to conclude the purchase with confidence. If she didn't have an answer at her fingertips she quickly did the research to locate the accurate information. I developed great confidence and trust in her abilities as I worked with her, and she will list my original home when it is ready to go on the market. I also like the very efficient title company she works with. I enthusiastically recommend Ginna as a Real Estate Professional." "Working with Ginna was a wonderful experience. We had our hearts set on Edmonds and got exactly what we were looking for. 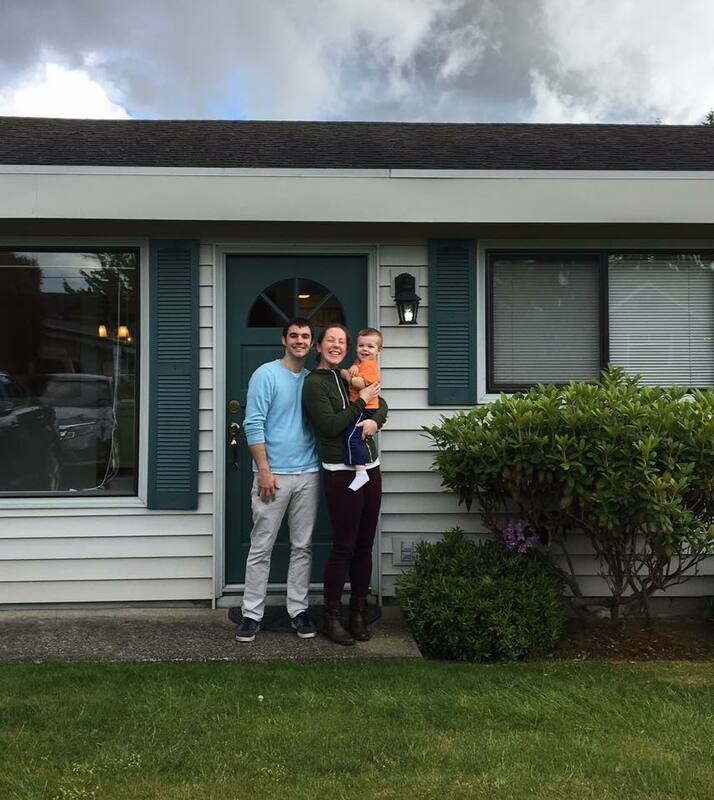 Ginna was extremely patient with our needs and helped explain every aspect of the home buying process. As first time home buyers she kept us competitive and knowledgeable in the blazing hot Edmond's market. I am so thankful we had Ginna's guidance and highly recommend her!" 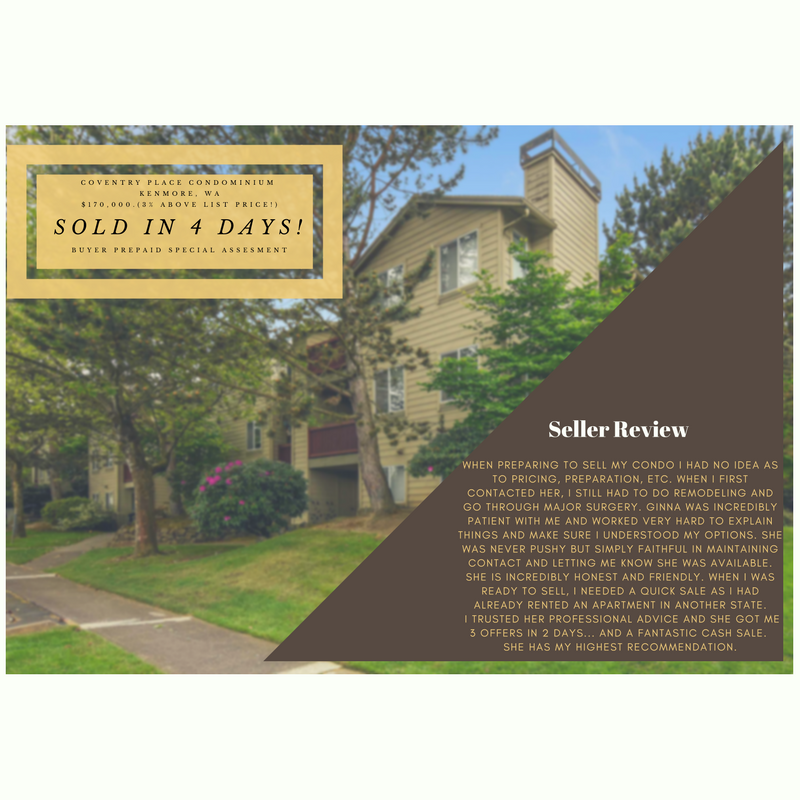 "Ginna both helped me sell my condo in Edmonds and buy a better condo. Ginna had the condo I owned staged, conducted two open houses, and had the condo sold in a week at a price $55 thousand above list rice. 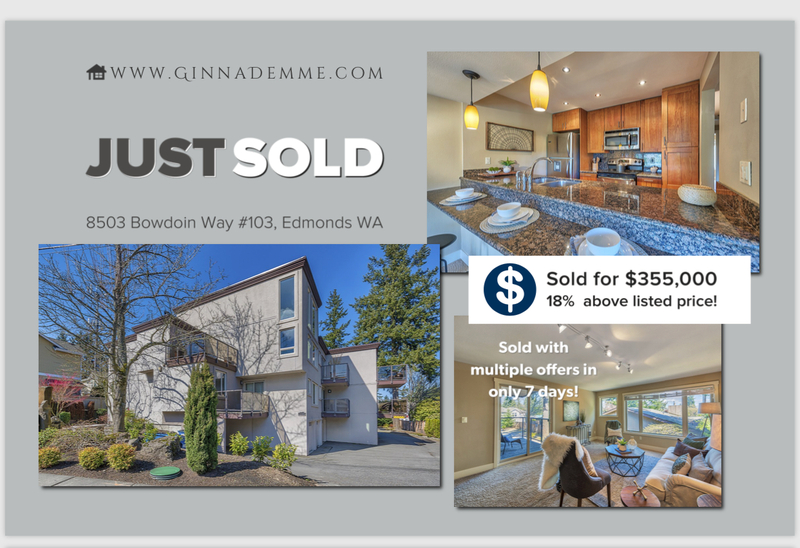 In buying another condo, Ginna demonstrated the knowledge it took to put together a successful bid in a very tough market for a buyer." 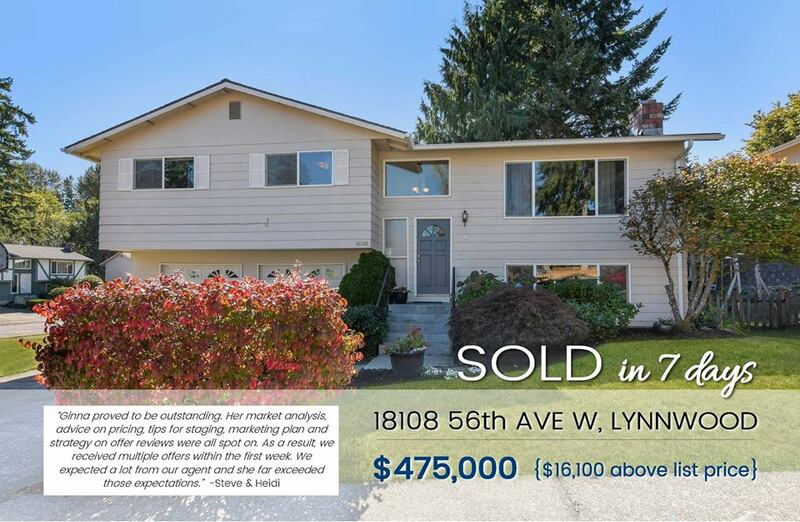 "I recently sold my house in Lynnwood and moved to Colorado. Ginna helped me get everything ready and had the house sold within a week for 11,000 over asking price! I thought it would be difficult since I was in a different state but she made sure everything was taken care of and went smoothly! If i ever move back I’ll definitely be using her again!" "Ginna is the BEST and we were so lucky to have had her help finding our new home! 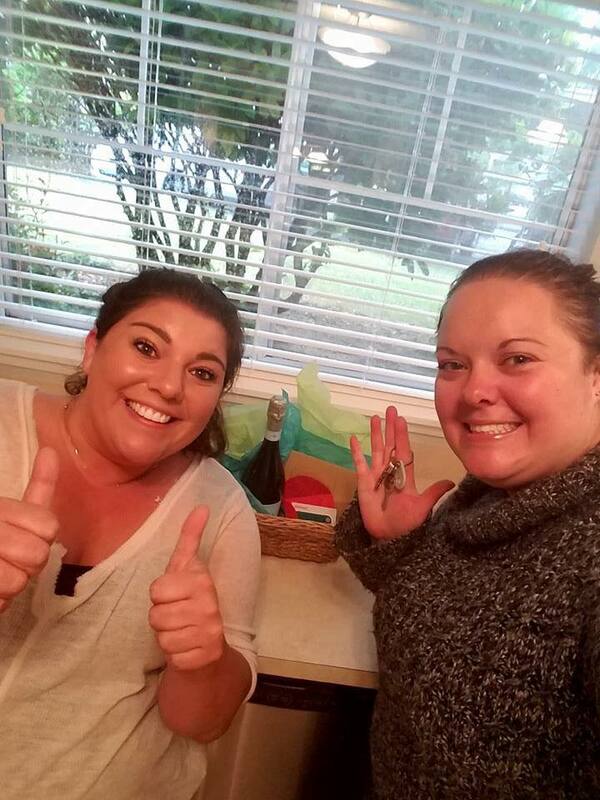 We were first time home buyers and very new to the process of purchasing a home. She explained everything and answered all of our questions fully. 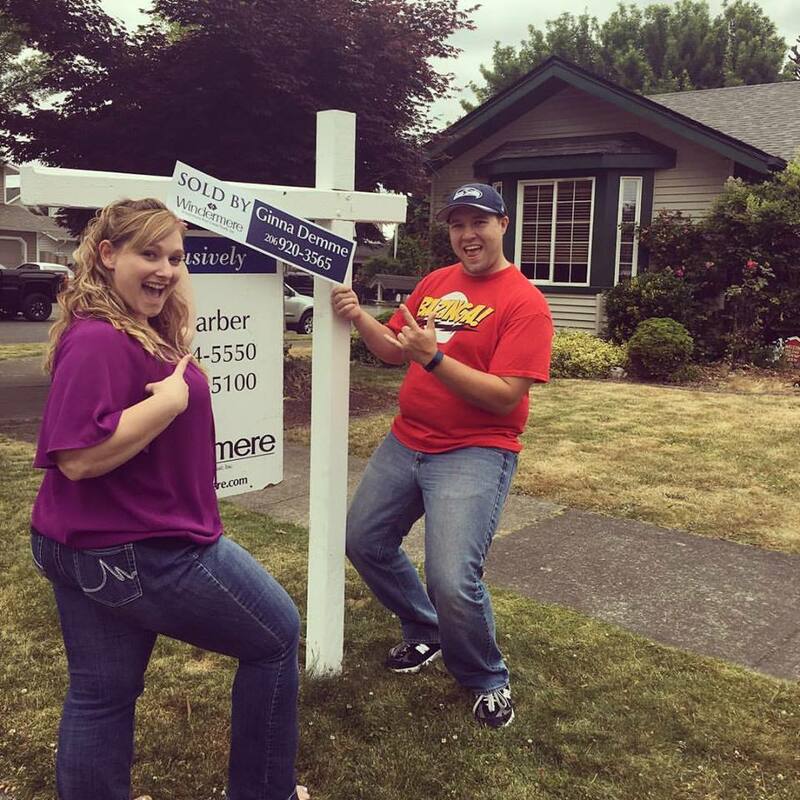 I am confident that the home buying process would not have been as fun or as easy without Ginna's help! She went far above what we would have expected from a realtor. Ginna is knowledgeable, patient, honest and highly responsive. There were times when she sent us homes that we may be interested in and then we were at the home viewing it minutes later! She was incredibly quick and listened to all of our needs. We were extremely picky about what we wanted and also were specific on pricing. Ginna made sure our offer was competitive but also made sure we got what we wanted for the right price. We are SO grateful for Ginna's help! If you are looking for a realtor, I highly recommend Ginna for buying or selling. She will keep your needs top of mind and she is a joy to work with!" "Ginna did a fabulous job assisting us with purchasing a manufactured home. Though not a huge purchase she treated us like we were purchasing a million dollar one. Very enthusiastic and had a bright cheerful honest attitude. What she didn't know she got the answer quickly and thoroughly. Extremely flexible with her time she was able to meet with us when needed. We never felt rushed or pressured into anything which was greatly appreciated. I would definitely recommend her and look forward to doing business with her again." "Ginna is an enthusiastic professional who works extremely hard to find just the right property for her clients. She helpfully suggests options, is quick to present pros and cons, and keeps an open mind. Her best asset is her willingness to do the necessary research on potential homes and present the details clearly and fairly. Her persistence and diligence make all the difference. She was a delight to work with!" "Ginna while relatively new the field is one very impressive young lady. 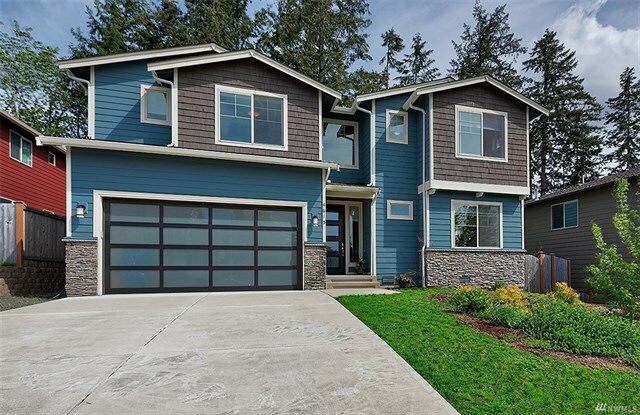 My wife and I worked with Ginna on a home search and purchase negotiation in the Edmonds area. We found the experience to be pleasurable as well as informative. Ginna was very energetic, detailed, clear in her explanations and spot on with her advice. I can say without her help number one we would never have found the home or been in a position to buy given the lack of inventory and the bidding process. Her guidance was, as I said, spot on. She understood what we were looking for as well as presenting properties that with some TLC would meet our needs. She made us aware of fitting properties when they first came on the market and provided sound advice on what she felt the ultimate sale price would be and provided a solid strategy when we made our offer. I would highly recommend her!" "Ginna helped us find our next home. We needed to find something quick since we had just sold our home. Ginna knew our urgency and was always available to help us find our perfect new place, which we did. She also helped make the whole purchase process smooth. Really appreciate her attention to detail."